In this day in age of social media it is so easy to fear you are missing out on something. 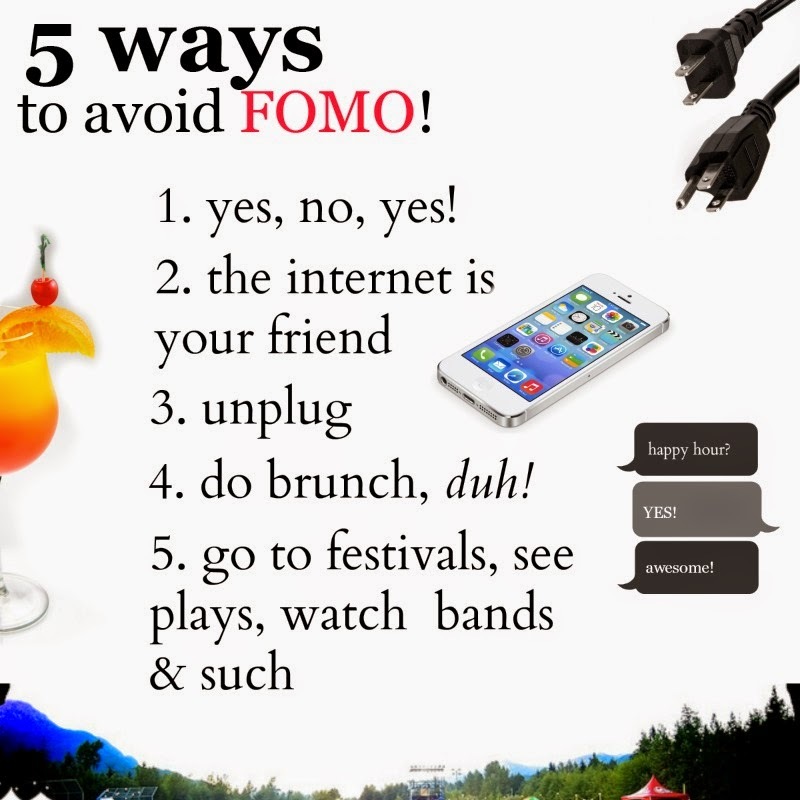 The great Fear Of Missing Out (FOMO). This year it's been hitting me a little bit more. Hear me out; in the morning on the way into work log into Instagram and see all the pictures of everyone who is going to a beach and another going to a more fun looking office than ours. During your brain break, log onto facebook only to see how much fun the over-sharers are having while you are busy being a grown-up or whatever you are doing. Or, maybe that's just only my situation...needless to say, here are a few tips I have to help us out. 1. Sometimes we put the FOMO on ourselves. I used to say no a lot to plans. Now, I am say yes more often. Say yes to the types of things you enjoy doing. There is nothing worst than saying yes to something we already know will make us miserable. 2. The internet is your friends. Social media and I have a love hate relationship. It is after all the source of all the FOMO. If you weren't online, you would not realize the "other" things you could be doing. So, make the internet work in your favor. Post pictures of the little things you enjoy during the day and share it. Block the people who clearly have nothing better to do and be a curator. Carefully select the people you follow on social media. 3. As much as it can be your friend, unplug. It's just not healthy. 4. Speaking of health, you should do brunch too. I am not the only one who from Friday afternoon to Sunday night, sees endless pictures of #freshflowers and #brunch food. So, do the same, go out for brunch or prepare yourself a very pretty meal. 5. Go see a show, whether it be a festival, play or concert, even a movie. There is just something about going somewhere to escape, just for a couple of hours. I do like movies, I do not go often but there is just something about going to see a funny film that will make you laugh your arse off that your troubles will be forgotten. Going to a music festival or concert to sing your feelings away. Remember, being a cool kid is a full time job. Could you imagine trying to keep up with every trend, going to every concert, being up to date with all things "in?"